After the fabulous Monty Bojangles truffles I decided that I'd be happy to pick up some similar products. These big bags seemed similar, but suspiciously a lot more fruity. I foolishly presumed these would be mostly cocoa but they are in fact 40% dates and contain my most behated thing - raisins! They do however have a recipie and everything is blended together so the predominant taste is indeed chocolate orange. The texture is soft and gritty, but not unsatisfiyingly so, there are seeds in here and they give it more texture than just a mushed fruit bar. The cocoa on the outside also means these are easy to handle even in the cinema. 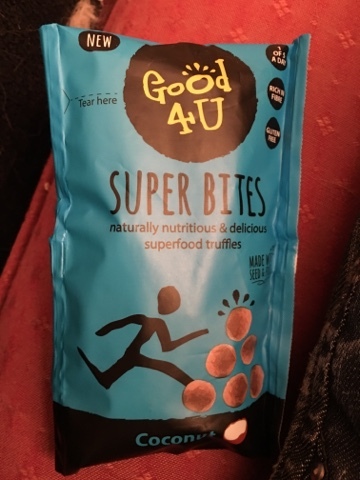 They have all kinds of goodness in them like seaweed and algae and despite essentially being balls of much do have a hint of variety in the flavours. I like them but I couldn't eat a bag in one sitting. I also picked up the coconut balls at the same time - confusingly not like the picture at the bottom but more constant all the way through. These have the same ingredients 40% date and then sunflower seeds then raisins but before we get to the cocoa powder we have coconut. This changes the texture a bit and leaves a satisfying amount of Bounty like bits to pick out of the teeth. 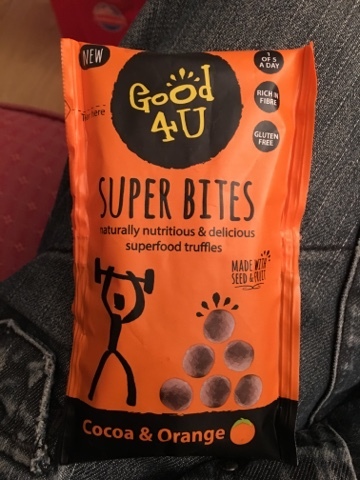 Again these are very much a healthy snack and have the chia seeds and dietary fibre at the bottom of the list but don't taste too much like something children would refuse. Both are fun little snack bags, and while I can't see people opting for these over Maltesers or Minstrels as the big bag cinema snack of choice they are a surprising little addition. A treat that has a bit of a nutritious edge rather than something to eat to turn your life around, but I think better for it because of that.